Father J. Scott Barker, Rector of Christ Church, Warwick from 2002-2011, had witnessed a great deal of young musical talent in his church and in the community. His parish had a wonderful adult choir and he hoped for a youth choir to perform at the church. He and his wife, Annie, had musical teenage children. Barker friends David and Lucia Crone also had musical teenagers (all musically-involved Christ Church members). Conductor/pianist/teacher David and classically-trained singer Annie had previously collaborated on a well-received summer community youth choir performance, so it seemed that a youth choir membership could reach beyond Christ Church and perhaps even past Warwick. Annie, David and Scott mulled this over for some time. Father Scott approached the Christ Church vestry members and they approved church financial support and rehearsal space for the choir. 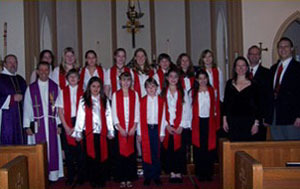 A youth choir steering committee of Christ Church members was formed and in August 2006 held its first meeting. Committee members were Annie and Scott Barker, David Crone, Liz Houlton, Lisa Laico, Debbie Schofield, and Joan Tirrell. Fr. Scott acted as head of the committee. David accepted the position of choir director. Annie volunteered to keep the choir and its affairs organized as manager; this later became a staff position. Conductor/pianist/teacher Steven Wing accepted the position of assistant director/accompanist and joined the steering committee. Lisa Laico was instrumental in procuring the choir’s concert attire. The choir’s name was chosen by the committee. The logo was created by Debbie Schofield and the web site provided by Steve Laico (both of Christ Church). Auditions were held at Christ Church in September, and the 12-member treble choir Jubilate – Community Youth Choir of Warwick was born. 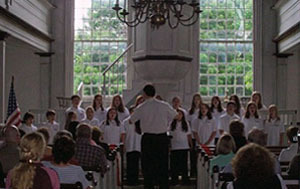 The choir rehearsed weekly throughout the fall and gave their first performance on December 17, 2006 at Christ Church on the occasion of the visitation of The Right Reverend Mark S. Sisk, D.D., then the Bishop of New York. Over a decade later, this choir now boasts 62 choir members drawn from four school districts and many communities in the lower Hudson Valley. It maintains a wonderful spirit and steady momentum. It has been blessed with terrific kids, a talented, dedicated staff, a conscientious, hard-working steering committee and enthusiastic support from Christ Church, Jubilate families and area musicians. We continue to anticipate great things!